August 2003, Sonoma County, CA — Tincknell & Tincknell, Wine Sales and Marketing Consultants, of Healdsburg, California, and Bauermeister Design of Sonoma, California, teamed together to create the packaging for a new, upscale, super-premium, three-liter boxed wine, the Blackburn Fine Wine Cache from Sonoma Hill Winery in Graton, California. The metallic gold, embossed design took First Place in the Best Application of Single Face Laminating category in the 11th International Corrugated Packaging Design Competition held by the Associated of Independent Corrugated Converters (AICC). The Blackburn Fine Wine Cache packaging design originated with Sonoma Hill Winery. Tincknell & Tincknell and Bauermeister Design took the preliminary design concepts – the gold foil exterior, the embossed pin-stripe, and the existing logo – and refined it to a complete package with a strong, branded identity. That effort resulted in a First Place win in the annual AICC design competition for the printer of the project, Pacific Southwest Container in Modesto, California. “PSC, with their knowledge and expertise in their business, assisted us greatly as the design was being developed and refined,” adds Tincknell, “They deserve the award for the stellar job they did in producing the package.” “It has been an exciting and rewarding experience to work with a team of experts in developing a high-end design that takes the packaging of wine to a new level,” says Karen Bauermeister, Owner of Bauermeister Design. The super-premium category of boxed wines is a new, emerging product niche that started with the introduction of the Black Box 2001 Napa Valley Chardonnay in January, 2003, another project Tincknell & Tincknell worked on. 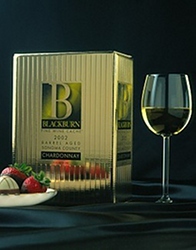 The Blackburn Fine Wine Cache is positioning itself as “the gold standard of wine in a box” with a 2002 Barrel Aged Sonoma County Chardonnay, a 2002 Barrel Aged Sonoma County Cabernet Sauvignon, and a 2001 Barrel Aged Sonoma County Merlot with a suggested retail price of around $35.00 per three-liter box. Three liters is the equivalent to four regular bottles of wine. Tincknell & Tincknell were founded in 1997 with the recognition that the wine industry needed expertise in applying new business strategies and technology to compete in the global wine industry. Tincknell & Tincknell provide services and consultation in sales, marketing, and technology to wineries, wine industry business partners, and other companies specializing in luxury products. Located in Healdsburg, Sonoma County, T&T have assisted such clients as Louis M. Martini Winery, Groth Vineyards and Winery, Hanzell Vineyards, Howell Mountain Vineyards, Lynmar Winery at Quail Hill Vineyards, Via Pacifica Imports, and the Qingdao Fushiwang Putaojiu Company in Pingdu, China. Bauermeister Design, established 2001, is a full-service graphic arts and design firm owned by Karen Bauermeister. Located in Sonoma, California, Bauermeister Design assists businesses in all industries in designing, developing, and producing branded materials such as packaging, collateral marketing support materials, direct marketing materials, business systems, and other corporate identity pieces. Tincknell & Tincknell are specialists in innovative wine packaging, from single-serves, to boxes, to Tetra-Paks, to aluminum bottles, to plastic bottles, to goat skins. We were at the cusp of the innovative wine packaging movement with branding, start-up assistance, marketing, and the sales launch of Black Box Wines. When it comes to packaging, no idea is out of the question at T&T. AICC, a part of the independent corrugated industry success story for over 25 years, represents a majority of the independent corrugated packaging manufacturers and their suppliers. They are dedicated to strengthening the independent’s position in the marketplace through programs and publications that empower their members to compete successfully in a rapidly changing industry and an increasingly competitive and global business environment. The 11th International Corrugated Packaging Design Competition was held September 18 and 19, 2003, in San Francisco, California. 175 entries from 47 companies were submitted for judging in 17 categories.